Cryoscope Now Up On Kickstarter, Has A New Look | OhGizmo! Did You Know That Transparent Aluminum Exists? Back in February we reported about the Cryoscope, a device that lets you feel the outside temperature by adjusting its own to match it. [It uses a] heat sink, a fan and a Peltier element, which is a thermoelectric pump. An Arduino brain fetches tomorrows forecast based on your previously entered zip code, and the device automatically adjusts its external temperature from 32F (freezing point) to 100F (tropical heat). Back then we didn’t know if you could even buy one, and as it turns out you couldn’t back then. 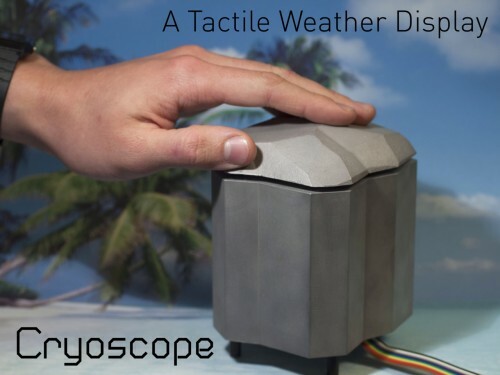 But today you can pre-order your now redesigned Cryscope on Kickstarter for $300. For cost and aesthetic reasons it’s no longer a cube but a crystal shape. It’s still made out of Aluminum.